Some friends of ours asked if we could come up with a concept to finish off their lower level. Its primary purpose would be for overflow entertaining and a place where the kids could hang out. We came up with some ideas and some basic drawings and they took it from there. I wanted to drop in and see how it turned out. Take a look! Hudson Remodel Part IX – Completed! I finally got the opportunity to visit and photograph the completed project. 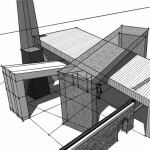 You can scroll back through the archives to see this project develop from design through construction. I was able to take a little time off this summer – nice! And we are fortunate to be very busy as well. Thus the delay in keeping you guys updated on what’s happening around here! Cabinets are starting to be installed! We are seeing some light at the end of the tunnel on the interior. The exterior got a fresh coat of paint and I will begin doing some studies to add a wrap around porch in the coming weeks! We have sheetrock! The spaces are starting to feel real now that the framing is getting covered. The finishes will follow soon with the bathroom tile underway. Check out the latest video and thanks for following along! 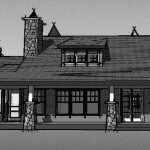 Hudson Remodel Part 7 from michael huber architects on Vimeo. And Chris from 1st Choice Builders wanted me to make sure everyone knows the invisible fence line he hit was on our project’s property! I am beginning a new project and thought I would document the progress. The home was built around 1910 with a subsequent addition in the back. The new home owners want to make a few changes some of which include remodeling the kitchen and dining area, open up/connect spaces on the main level, and create a new master suite on the upper level. This will be a fun project as the clients are great people! Take a look! 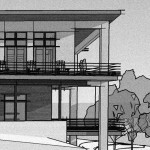 Hudson Remodel Part I from michael huber architects on Vimeo. Twin Cities Remodel -The End? We wanted to post a quick update on this project and show a few of the ‘test’ concepts. 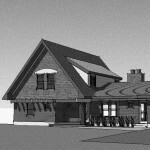 This initial effort was to incorporate the entire Client wishlist and see how this small home could be transformed. The tough part, which we all knew, was getting feedback and reality checks from contractors, banks and realtors. The problem with this project is not the house, it’s the site. A third of the property would need to be excavated and hauled out of a city setting just for a new garage. That is a big chunk of any budget. The other challenge is that this project was looked at as a development opportunity and could the neighborhood actually support this financial investment? Now comes the tough part for the Client – evaluating all of the feedback, adjusting priorities and deciding which way to go… Stay tuned! This is Part 1 of a series where we take a 1920’s era house and transform it into modern and fresh home for an old friend… not that we are old! Follow along (subscribe!) as we face many design, budget and construction decisions as well as navigate through the process of remodeling in an urban setting.